Food4Macc.org: Visit to L'Endroit Honey, Congleton. Visit to L'Endroit Honey, Congleton. Today (Sunday 5th Aug) as one of the F4MD member events we were able to visit Eli from L'Endroit Restaurant in Congleton and his bees who make the L'Endroit honey on our produce list. He has 65 hives, 6 of which are in Congleton and the others spread over 19 locations. 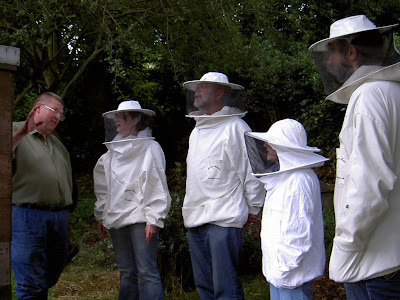 We donned our protective clothing and started off near the restaurant where he has his young 'Nursery Bees' then walked just 5 mins away to see the other group of mature hives. As you got nearer you could hear the hum of thousands of busy bees. 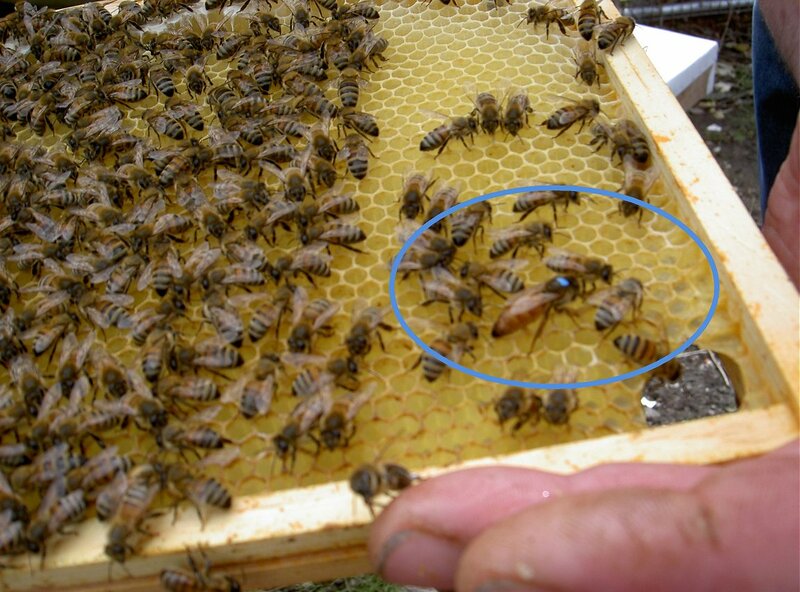 The pics show the filled honeycomb which is very heavy and the queen bee with a blue marker on it. The queen can live for up to 5 years but during the summer the worker bees only live for 6 weeks and in winter, 6 months. The queens are pedigree and often sent through the post if purchased. Last year Eli was able to produce approx. 2.3 tonnes of honey which is about 6000 jars! When the honey is harvested there is always plenty left behind for the bees to have, approx 25kg over winter. We all really enjoyed the visit and none of us were stung!